President Trump's immigration policies follow economic nationalism. Trump's "America First" program seeks primarily to protect American workers and industries. It's a departure from decades of a more balanced U.S. immigration policy. Trump's immigration policies center around six major areas. Completion of the border wall with Mexico. Deport immigrants who arrived in the United States as children. They are currently protected under the Deferred Action for Childhood Arrivals program. Restrict travel and work visas from eight countries. Increase screening of refugees while cutting the staff needed to do so. Review the H-1B visa program. The foreign-born population in the United States reached 44.5 million in 2017, 13.7 percent of the total population. The majority of those people, about 41 percent, came from Asia and 39 percent from Latin America. Below you can see a breakdown of historic immigration to the United States from 1850 to 2016. President Trump promised to complete a wall on the 2,000-mile long U.S. border with Mexico. The Secure Fence Act of 2006 built 650 miles of walls and fencing. Between 2007 and 2015, $2.4 billion was spent. Its efficacy has been hard to assess. Trump has already devoted funds to replacing or enhancing segments of the existing wall. The government uses the number of apprehensions as a way to track immigration levels. In 2018, there were 403,479 such apprehensions. They're down since a record 1.67 million in 2000 because border security is better. Half of all currents immigrants without documentation crossed the border with visas but stayed after they expired. Trump promised to force Mexico to pay for the wall. If it refused, he threatened to change a rule under the U.S.A. Patriot Act anti-terrorism law. He wanted to confiscate Western Union money transfers sent to Mexico from immigrants. The Mexican central bank reported that it received $25 billion from abroad. There are no exact figures on how much of that is from U.S. immigrants. But that didn't happen. Instead, Trump asked Congress to appropriate $25 billion in the Fiscal Year 2019 budget. He promised to ask Mexico to pay for it later. Congressional Democrats offered $1.3 billion to continue current border-security funding. On December 21, Trump vowed to veto any budget bill without at least $5.7 billion in wall funding. As a result, nine federal government departments shut down for 35 days. Congress approved a budget package that includes $1.375 billion for 55 miles of new border fences. It adds $1.7 billion to Homeland Security's budget for additional border security. Trump declared a national emergency in addition to signing the spending bill. He plans to use the emergency to repurpose existing military spending to build the wall. He may also repurpose funds from the Army Core of Engineers designated for hurricane disaster relief. But he will face lawsuits from Democrats. The Constitution states that only Congress has control over the budget. Democrats largely oppose the border wall, but Republicans are largely in favor. Residents of California, Arizona, New Mexico, and Texas face the most consequences. Critics say the wall won't work, especially without added security forces. Others worry about the impact on the environment in their states. The conservative Heritage Foundation says the money would be better spent on technology and agents to prevent illegal crossings. It suggests more enforcement to apprehend immigrants who overstay their visas. Trump wants to eliminate the appeals process for asylum seekers. Instead, he wants to deport anyone who appears up at the border without documentation. His administration also briefly separated immigrant children from their parents before ending the policy due to popular outcry. His administration provided unclear justifications for the policy, though some officials said it was intended to discourage other undocumented immigrants. Trump has also attempted to restrict asylum applicants to use only designated ports of entry, but federal district judge ruled against the order as it violated current immigration laws. On October 31, 2018, the Trump administration sent 5,000 active duty and National Guard troops to the Mexico border. They will remain through September 2019. Trump sent the troops to respond to thousands of migrants who banded together to protect each other on the dangerous trek and to avoid using human traffickers. They are seeking asylum from dangerous and oppressive conditions in their home countries. On November 25, 2018, the United States temporarily closed the border to Mexico. Customs agents fired tear gas at members of the caravan who had rushed the border fence. Skirmishes at the border continue. One reason for the uptick in asylum-seekers is an increase in drug-related violence in Guatemala, El Salvador, and Honduras. The gangs are partly fueled by the illegal drug trade to the United States. Since November, the number of migrant families applying for asylum at the U.S. border has increased dramatically. On June 22, 2017, Trump asked Congress to prevent all immigrants from receiving welfare for the first five years in the country. The move would take away the authority of states who currently decide who is eligible for assistance programs. Trump would also enforce regulations that deny immigration status to those who seem likely to become "public charges" within the first five years of their arrival. The Department of Homeland Security found that use of welfare among undocumented immigrants was negligible, less than 1 percent. It reported that 15.5 percent of undocumented immigrants benefit from Medicaid. Around $2 billion a year goes to hospitals who must care for anyone who shows up at the emergency room. The percentage is similar to the 16.1 percent of native-born Americans who use Medicaid. The study found that 9.1 percent of undocumented immigrants used food stamps, compared to 11.6 percent of native-born. Many undocumented immigrants receive the benefits because they live in households with eligible Americans. On January 9, 2018, the U.S. District Court in San Francisco issued a preliminary injunction against Trump's attempt to end the Deferred Action for Childhood Arrivals (DACA) policy. The policy protects "dreamers" – individuals who were brought to the United States illegally as children – from deportation. The judgment overrode Trump's announcement that he would end DACA on March 5, 2018. There are still pending legal actions against DACA. Trump wants Congress to create a replacement program. On January 26, 2018, Trump released a proposed immigration plan. It would offer a 12-year path to citizenship for 1.8 million immigrants who arrived in the United States illegally as children. It would replace President Obama's Deferred Action for Childhood Arrivals program. On April 24, 2018, the Federal District Court for the District of Columbia ruled that the Department of Homeland Security must better explain its reasons for canceling DACA. If it doesn't do so in 90 days, the department must resume processing DACA applications. On August 4, 2018, a federal judge ruled the Trump administration must fully restore DACA. On November 8, 2018, the 9th U.S. Circuit Court of Appeals upheld DACA. On January 19, 2019, Trump offered to protect the Dreamers for three years in exchange for border wall funding. Democrats rejected it because it's not permanent. DACA offers a two-year deferral of deportation for eligible immigrants. Eligible people are those under 31 who were illegally brought to the United States as children. President Obama launched the program with an executive order in 2012. Since its launch, 2,261,485 dreamers have applied for and received work permits. The Cato Institute estimated that elimination of DACA could cost the economy $215 billion over 10 years. That's the amount of lost spending power from these employed young people. In January 27, 2017, Trump issued an order banning travel from seven majority-Muslim countries. It also barred entrance to Syrian refugees. This order was blocked in federal courts. In March of 2017, Trump released a revised order, which was also struck down, though the Supreme Court allowed it to go into partial effect. On September 24, 2017, Trump issued a third version of the travel ban, enacting restrictions on travel from eight countries. Chad: Bans immigrant, business, and tourist visas. Iran: Bans immigrant, business, and tourist visas. Allows student and exchange visitor visas. Libya: Bans immigrant, business, and tourist visas. North Korea: Bans immigrant and tourist visas. Somalia: Bans immigrant visas except for those with family or an infant needing medical care. Syria: Bans immigrant, business, and tourist visas. Venezuela: Bans business and tourist visas to government employees and their families. Yemen: Bans immigrant, business, and tourist visas. The variations depended on how well the countries adhered to recommended security measures. On October 17 and 18, 2017, federal courts halted portions of President Trump's travel bans. The judges said that the bans on predominantly-Muslim countries are unconstitutional. They interpreted Trump's own words to infer that his bans on Chad, Iran, Libya, Somalia, Syria, and Yemen were based on religion. On December 4, 2017, the Supreme Court allowed the Trump administration to implement its travel ban while litigation continued. In a 5-4 ruling released on June 26, 2018, the Supreme Court ultimately upheld the legality of the this ban. On March 6, 2017, a Trump executive order banned refugees for 120 days unless they were already scheduled for travel. Homeland Security has reviewed the application process to prevent any exploitation by terrorists. Trump planned to halve the total number of refugees accepted to 50,000 per year. Federal judges stayed those orders. That gave the State Department the ability to increase the number of refugees to 70,000 in 2017. On October 24, 2017, the Trump administration allowed refugees from all but 11 countries. For the next 90 days, refugees from those countries had to show their arrival would be in the U.S. "national interest." The 11 countries included Iraq, Iran, Somalia, Syria, and Sudan. One official said they account for 63 percent of refugees. According to the Pew Research Center, 53,716 refugees were resettled in the United States during fiscal year 2017. A breakdown in the bar chart below shows that refugees from the Democratic Republic of Congo were the biggest group, accounting for 17 percent. They were followed by refugees from Iraq (13 percent), Syria (12 percent), Somalia (11 percent), and other countries. In 2018, the Trump administration cut the staff that conducts clearance interviews overseas and intensified the screening process for refugees. It also doubled the number of people it characterizes as high-risk, increasing their screening process. As a result, it's estimated that only 22,491 refugees were resettled in 2018. That's the lowest figure since the resettlement program was created with the passage of the Refugee Act in 1980. The steepest decline is with Muslims. In fiscal 2016, 38,900 Muslim refugees came to the United States, according to the State Department. In 2017, that number fell to 22,861. Only 3,495 entered in 2018. On April 18, 2017, Trump signed an executive order asking the Department of Homeland Security to review the H-1B visa program. He wants to make sure that only highly-paid skilled immigrants receive the visas. He doesn't want any to go to foreign workers that are paid less than their U.S. counterparts. That's ironic, since his Mar-a-Lago club sought H-1B visas for its cooks and waiters. It could take years for the review to be carried out. The order is directed at foreign firms that operate in the United States but bring employees from abroad. Major tech companies are also big users of the H-1B visa. The U.S. Citizenship and Immigration Service is sending many H-1B visa applications back for "further evidence.” At least 25 percent of such applications are being rejected compared to 20 percent a year ago. Silicon Valley CEOs worry that Trump might restrict this program. The Immigration Act of 1990 provides temporary visas to 315,000 foreign skilled workers. Two-thirds were for computer-related jobs. These companies would lose valuable employees without the H-1B visa program. That would hurt the success of some of America's most profitable companies. On August 2, 2017, Trump endorsed a Senate bill that curbs legal immigration. It would prioritize those who were financially self-sufficient, were highly skilled, and spoke English. It would deny green cards to adult children and extended relatives of current green card holders. Cards would only be available to spouses and children. The plan would end the diversity visa lottery. If the bill became law, it would reduce the number of green cards issued from 1 million to 638,000 in its first year. The number of employment-based green cards would remain at 140,000 a year. Two-thirds of cards go to relatives and 20 percent are employment-based. The rest are issued via lottery, to refugees, and on other grounds. The program is similar to merit-based systems in Australia and Canada. The bill has little chance of passing. It would need a 60-vote majority in the Senate. Democrats would oppose it. In his 2017 State of the Union address, Trump established the Victims of Immigration Crime Engagement. It helps victims of crimes committed by removable criminal aliens. On October 8, 2017, the Trump Administration released a list of immigration requests to Congress. The wish list requested $25 billion in funding for a wall on the border with Mexico. He wanted Congress to create a bill that would treat unaccompanied minors from Central America the same as those from Mexico. Currently, they receive greater protection. Trump asked Congress to withhold federal funds from "sanctuary" cities. Those municipalities don't cooperate with federal immigration agents. On November 1, 2017, Trump said he would eliminate the diversity lottery for foreigners seeking U.S. visas. He also asked the State Department to intensify extreme vetting of immigrants. He was responding to the terrorist attack that killed eight people in New York. The attacker had won his visa through the lottery. The Trump administration may require immigration officers to consider how many public services applicants for U.S. citizenship are using. The Department of Homeland Security would look unfavorably on those who use Medicaid, food stamps, and even the earned-income tax credit. The administration prefers applicants who are financially self-sufficient. As a result, even legal immigrants are avoiding health care and other services. The issues relating to immigration remain a hotly-debated topic. Many argue whether the contributions immigrants make to the U.S. society outweigh the drawbacks. The following list of pros and cons presents some of the issues that affect native-born Americans. Some of them support Trump's policies, while others aren't so clear cut. Immigrants in the workforce will pay taxes and Social Security to replace the money lost by aging baby boomers. In 2014, immigrant women had 44% more children than native born American women, who will become tax payers to support the current working population during retirement. College-degreed immigrants generate over $100k more in revenue than they receive over their life. Immigrants living in America illegally cost less than legal immigrants due to lack of eligibility for government programs. Immigrants add about $1.6 trillion to the U.S. annual economy, the majority of which is spent in America. The number of native workers during a 13-year period fell due to retirement and choosing college over work, while 30% of 16 million immigrants took jobs. Immigrants hurt job prospects for native-born workers. Wages for unskilled labor jobs are lowered due to illegal immigrants by 3–8%. Mass deportation would reduce the country's GDP by an estimated 1.4% due to a reduced labor supply. Deportation costs could run as high as $60 billion, while immigrants contribute more than $28 billion to the economy. Immigrants have a net cost to the government of $11.4 billion - $20.2 billion annually, although native-born Americans with similar education and work background cost more. If the U.S. granted illegal immigrants amnesty, their costs to society would double. The Center for American Progress estimated that mass deportation would reduce U.S. gross domestic product by 1.4 percent. This liberal research group estimates that farmers would have a hard time finding replacement workers. Instead, they would be forced to cut their production to fit the reduced labor supply. The Cato Institute reported that it would cost $60 billion to deport the 750,000 people protected by DACA. They contribute $28 billion a year to the economy. Immigration more than pays for itself. Immigrants add $1.6 trillion to the economy each year. Of that, $35 billion is a net benefit to the companies and communities where they live. The rest (97.8 percent) of that growth returns to the immigrant workers as wages. They repatriate $25 billion back to family members in Mexico. They spend the rest in America. Native-born workers who compete directly with the immigrants for jobs are hurt the worst. Those are the young, less-educated, and minority workers. Their unemployment rate is higher than for older, college-educated, and white workers. Illegal immigration lowers wages by 3 to 8 percent for low-skilled occupations. That averages out to $25 a week for native-born workers without high school diplomas. President Trump promised during his campaign to require companies to offer all jobs to Americans first. Between 2000 and 2013, the number of native-born workers fell by 1.3 million. Studies show that they left the workforce. Many older workers retired or went on disability. Younger workers went back to school. During that same period, the number of working immigrants rose by 5.3 million. That's out of 16 million immigrants who arrived in America. According to the Cato Institute, immigrants cost the U.S. government between $11.4 billion and $20.2 billion each year. They use that much more in services than they pay in taxes. On the other hand, they cost the government less than native-born Americans with similar education and work histories. Immigrants in the workforce pay taxes into Social Security and Medicare. It improves the age dependency ratio, or the number of working people who support the nation's senior population. The ratio is worsening because the native-born population is aging. There aren't as many in the working age population to support them. As more immigrants enter the workforce, the age dependency ratio improves. Immigrant women are also more likely to have children. 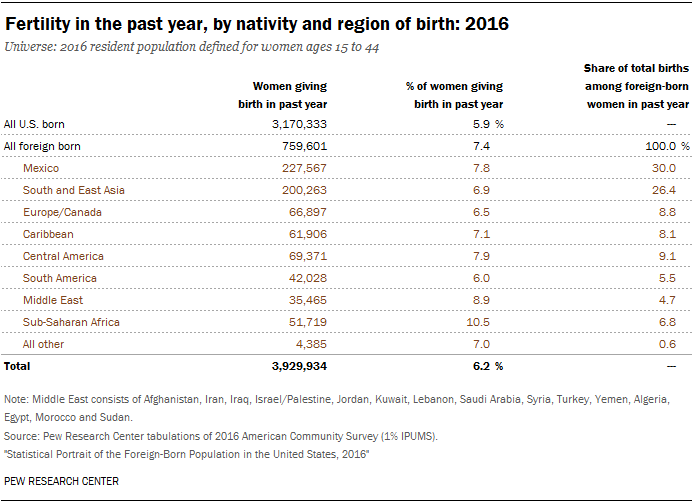 Foreign-born women had 7.4 percent of births in 2016, while American-born women had 5.9 percent. The higher birth rate of immigrants helps support the current working population when they retire. Immigrants with college degrees generate $105,000 more in revenue than they receive in services over their lifetimes. Almost 53 percent of immigrants have some college education. Of those, 16 percent have a graduate degree. Immigrants living in the United States illegally cost the country less than legal ones. They are not eligible for many government programs. 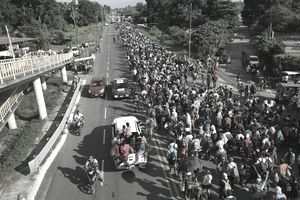 If the government granted them amnesty, the costs to society would increase significantly, a study by The Center for Immigration Studies found in 2004.